Elections were held for three Rajya Sabha seats today. There are four candidates - BJP chief Amit Shah, union minister Smriti Irani, Ahmed Patel and Balwantsinh Rajput, fielded by the BJP to take on Mr Patel for the third seat. 176 MLAs in Gujarat voted in the Rajya Sabha elections. As Gujarat legislator Karamsinh Makwana voted in the Gujarat Rajya Sabha election on Tuesday, he refused to show his ballot paper to the polling agent sparking speculation that he has cross-voted. Mr Makwana is one of the 44 Congress legislators just back from a luxury stay at a Bengaluru resort and who senior party leader Ahmed Patel is counting on for his re-election to the Upper House of Parliament. Which the BJP is determined to stall, turning it into a big prestige battle. The Congress has confirmed that Mr Makwana defied a party whip or order and voted against Ahmed Patel, which leaves the political advisor to Congress president Sonia Gandhi two short of the 45 votes he needs to win today. And so completely dependent on external help from Sharad Pawar's NCP and a lone Janata Dal United legislator Chhotubhai Vasava. It is touch and go for Ahmed Patel with conflicting reports on how these MLAs have voted today. Mr Vasava told NDTV as voting ended, "I have performed the duty of a loyal friend and voted for Ahmed Patel." But soon after top JDU leader KC Tyagi said that the MLA has followed the instructions of party chief and Bihar Chief Minister Nitish Kumar to vote for the BJP, the JDU's new alliance partner in Bihar. "Nitish ji had asked our Gujarat MLA Chhotubhai Vasava to vote for BJP and he voted BJP," Mr Tyagi said. 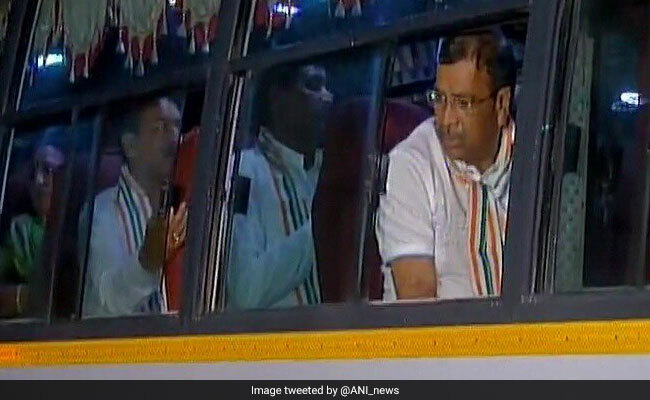 43 Congress legislators returned from Bengaluru on Monday and were whisked away to a resort in Anand. Ahmed Patel has also been counting on the support of at least one of two MLAs of Sharad Pawar's Nationalist Congress Party or NCP. Both were told to vote for Mr Patel by the NCP, but one of them, Kandhal Jadeja, made it clear he would vote for the BJP candidate. It was not clear how the other NCP legislator, Jayant Patel, has voted. If both Mr Vasava and Jayant Patel voted for Ahmad Patel, he will have 45. If neither Ahmed Patel nor Balwantsinh Rajput gets 45 votes to win directly, second preference votes of each MLA will be counted. That will mean the end of the game for Ahmed Patel, given the BJP's far superior numbers. Elections were held for three Rajya Sabha seats today. There are four candidates - BJP chief Amit Shah, union minister Smriti Irani, Ahmed Patel and Balwantsinh Rajput, fielded by the BJP to take on Mr Patel for the third seat. Mr Shah, who makes his debut in Parliament and Ms Irani will win two seats as the BJP has a big majority in the Gujarat assembly, whose members vote in this election. Till two weeks ago, the Congress had 57 legislators. Then six of them resigned, three joining the BJP, including Balwantsinh Rajput. They can't vote and so the house strength is down to 176. The Congress' current tally in the assembly is 51, including local heavyweight Shankersinh Vaghela, who parted bitterly with the party two weeks ago, but remains an MLA. Mr Vaghela, seen to be the chief architect of the Congress' current disarray in Gujarat, declared Ahmed Patel defeated this morning, confirming that he had voted for the BJP's Balwantsinh Rajput, who is also his close relative. Six other MLAs are close to Mr Vaghela and the Congress has expected them to go against it. Two of these legislators declared they had voted for the BJP and the Congress has demanded they be disqualified before results are announced. 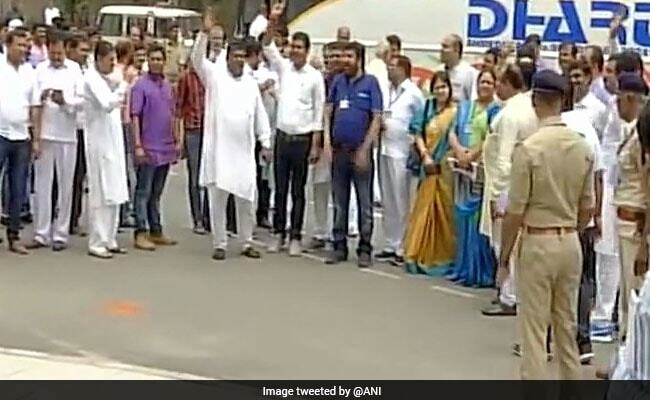 Ahmed Patel, a five-term Rajya Sabha MP, told NDTV after voting ended today, "I have never seen such a tense and bitter poll battle in my electoral life." But he also insisted that he has the numbers.